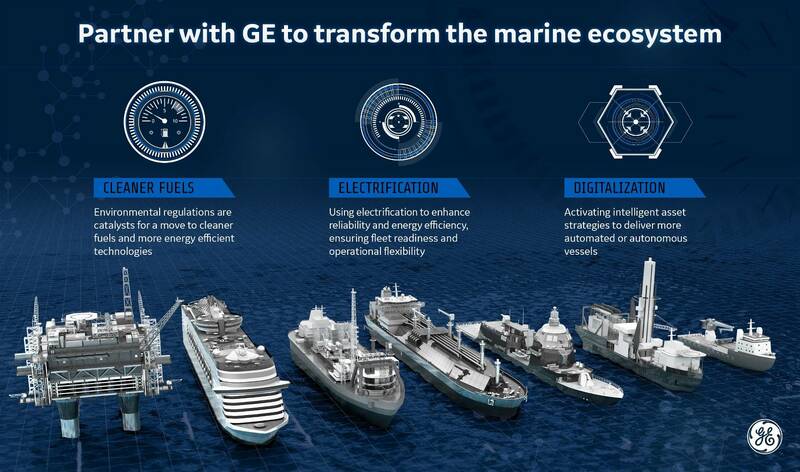 GE’s Marine Solutions president & CEO Tim Schweikert discusses the major transformations driving change in the maritime industry. Cleaner fuels – There is a significant shift to achieve lower emissions through the adoption of clean technologies. It’s driven by environmental regulations, new designs and natural technology refresh in aging vessels. We are seeing the more widespread introduction of gas as a clean fuel for future shipping. Electrification – As electrical technology grows ever-more efficient and capable, we are seeing a shift from mechanical, fuel-based technologies towards integrated electrical power and propulsion. Digitalization – Like every industry, digitalization is catalyzing a substantial shift in the way physical assets are managed. We are seeing a rapid shift towards using software analytics to increase productivity, reduce unplanned downtime and enable predictive maintenance. This is helping to address global skill shortages by allowing a smaller engineering base to support a larger fleet, and it is bringing to life the vision of autonomous ships. But why change now? Well, as has been the case so often throughout history, adversity is forcing innovation, and the marine industry has been through a number of challenges over the past few years. A convergence of forces—including market volatility, an aging workforce, increased regulation and the complexity inherent in the sector—have hit different parts of the marine industry in different ways. The offshore sector, with its capital-intensive assets, is struggling to lessen the impact of downtime while operating in remote environments with a shrinking workforce beset by chronic skill concerns and labor shortages. The challenge of attracting a new generation of talent to this area is a longstanding one, and it is a challenge that automation will have to play a part in addressing. In contrast, the cruise sector is faced with soaring demand in new markets, like China, but also with new environmental regulations. This is challenging operators to cut fuel and reduce their emissions’ footprint as they fight to keep utilization high to maintain their margins. In the naval sector, the need to be mission-ready with zero tolerance for system failure is as high as ever. Given that, in some cases, fleet sizes are shrinking, the requirement for total operational confidence is particularly critical. In cargo shipping, falling rates (in both containers and bulk) have been offset to a degree by low fuel prices. However, this hasn’t masked the overall challenge; oversupply of vessels and aging fleets will continue to unbalance supply and demand, forcing operators and owners to scrap millions of dollars’ worth of investment. It is vital that the industry embraces the opportunity that transformative technologies unlock to drive wholesale change, by looking at the marine industry as an ecosystem rather than dealing with individual vessels as isolated assets. As such, understanding that everything you do, every decision you make, is interconnected and will affect something else, is key to identifying opportunities for efficiency. For example, data derived from asset management tools can be fed into ship designs to build more optimized vessels, contributing to lower fuel usage, bringing down emissions, saving costs and keeping compliant with environmental regulations. In a parallel way, data fed back to marine society and regulatory bodies can help identify macro behavior patterns for better governance and to improve policies for the sector’s long-term sustainability. Driving compliance with environmental regulation, and using it as a catalyst for change across fleets by using cleaner fuels and more energy-efficient technologies. Using electrification to enhance reliability and energy efficiency, ensuring fleet readiness and operational flexibility as well as improving performance to control costs. Activating intelligent asset strategies such as using fleet intelligence and digitalization to unlock the potential for greater efficiency in the marine industry and to enable more automated or autonomous vessels. Delivering this transformation is happening in the marine sector today. We expect to see greater collaboration across the marine industry—operators, technology experts and ship builders, designers and owners all working together to accelerate innovation across the ecosystem. Change needs to be permanent, sustainable and industry-wide—in both machines and people. We are seeing a wider cultural change as organizations adapt themselves to the new market reality. At GE, we too are on a journey; to transform the company into a digital industrial business. It’s a journey we are taking with our customers and partners, as we work towards a better, more sustainable future for the sector. 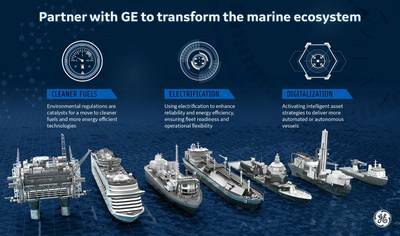 In the coming months, we’re going to look more closely at each transformation—cleaner fuels, electrification, digitalization—to assess how they link together to make up the marine ecosystem and how GE is proactively working with marine industry operators to embrace this new way of working. Tim Schweikert is president & CEO, GE’s Marine Solutions.